Allowing children to 'swing higher', 'ride faster' and 'climb higher' is a safe and controlled way we can help a child develop great decision-making skills and give them control over their risk-taking. How fast? How high? How can I do this? promotes problem-solving and huge self-esteem development, this gives the children the 'power' of learning. The natural world awaits the child. It is filled with endless opportunities for learning and discovering new things. Outside there are wonders that surprise us, interest us and amaze us. The sound of raindrops on the tin roof of the cubby house, the golden leaves that sparkle in the autumn sun and the dirt that wants to be touched are all examples of the beauty around us. Children are naturally curious and will seek to understand the world around them. When they do this, we can support their curiosity with prompts, questions and rich language. Noticing something interesting and sharing it with a child creates a space for co-constructing knowledge together. Outside, all the child’s senses are stimulated. They are often more relaxed, and a sense of calmness appears to encompass them. When children are relaxed and have periods of uninterrupted play and discovery, they will inevitably be learning and developing. The opportunities are endless if we are attuned to the possibilities. Next time you're outside with your child, put your science hat on and look for the butterflies, the ant trail or the worms making rich soil for the garden to grow. Or put on your maths hat and count the trees. Talk about which one is bigger, taller, wider and been there longest. Learning mathematical language is an important foundation for further mathematical learning. Concepts such as before, after and first, second and third help children understand numbers and patterns. While talking with children, we are promoting language and exposing children to new words and phrases, thus developing their conversational and literacy skills. I like the example that if a child can say "Tyrannosaurus Rex", they can say words such as "metamorphosis" and "photosynthesis". It is widely acknowledged that being outside contributes to reduced stress levels and promotes a sense of well-being within us. So my tip is to make some time each day to get outside with your child. Engage with the natural world, and maybe even take your shoes off and walk in the grass barefoot together. I am sure you’ll love it, and the best part, it’s free. Orientating a child into a kindergarten or childcare centre is an exciting time for families, but it can also be an overwhelming and emotional experience. However, when you and your child are orientated in a sensitive and supportive way, the experience can be a wonderful way for you to build great partnerships with educators. Ensure you have a centre visit and tour before your child starts. This is a great chance for you to meet the director and the educators who will work with your child. Many centres offer a one or two week orientation period. Try and use this time to visit the centre with your child. During this time, your child will start to explore and familiarise themselves with their new environment, and build trust with their educators. It is also a great opportunity for you to meet your child's educators and share information about your child with them. While orientating, educators may ask you to leave the room for short periods. During this time you may choose to have a cuppa and speak to the director, ask questions and discuss any concerns. During your short absence, educators will begin to establish trust and form connections with your child. Should your child become distressed, rest assured educators will ask you to come back to help settle them. The orientation process should be a pleasant and stress-free time. Educators understand this can be emotional for both families and children. That's why they strive to ensure when it's time to leave your child for the day, you feel comfortable and reassured they will be cared for in the best possible environment. My answer: Young children have small stomachs and short attention spans, so when food is abundant, they may not eat what you give them. Plus, children often think they have more important things to do than following our ‘three meals a day’ schedule. And for some children, it turns into a fun game to make the parents scramble about to find food the child likes, and a power struggle ensues. On the instinct side, young children are mobile and are developing their reasoning skills, so being picky helps them avoid foods that might be dangerous to them (especially foods that are bitter, as these are more likely to be poisonous). Sometimes what tastes delicious to a parent will not be so enticing for a child due to personal preferences, sensitivities and increased sensitivity to particular tastes at different developmental ages. But given the right encouragement, most children will try the new foods they observe their parents eating. Rest assured that picky eaters won’t waste away, as their stomachs are only the size of a clenched adult fist. And children will usually end up eating when they’re hungry. If you continue to feel concerned, I encourage you to consult your maternal health nurse or GP. Children use their senses – taste, touch, smell, sight and sound – to understand the world around them. Engaging in regular sensory play helps children develop important communication, motor, social, cognitive and problem-solving skills. Simply put, sensory play is any activity that enables a baby or child to securely discover their world using any combination of their senses in imaginative and spontaneous ways. Give your child play dough, kinetic sand, sludge, mud or any other sensory materials. Keep natural and recycled materials for your child to use in their sensory play. Examples include recycled jars, snack boxes, water bottles, fabric remnants, baby wipe containers, etc. 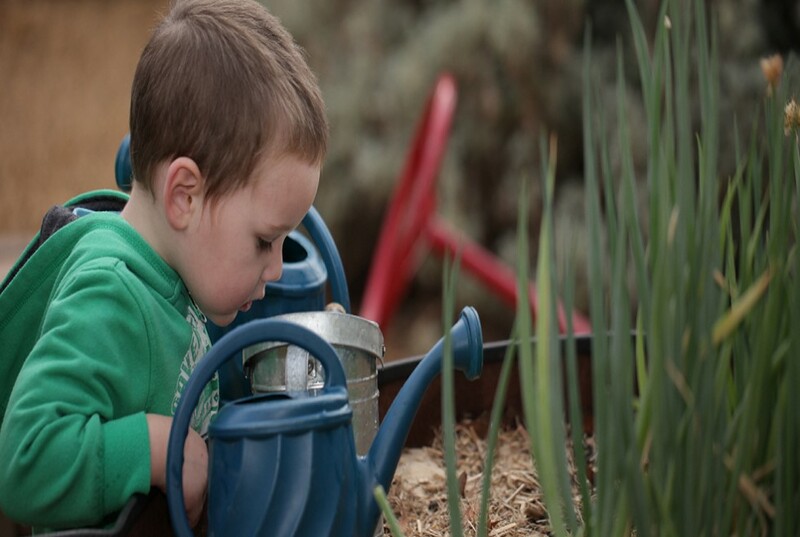 Find flexible indoor and outdoor areas for your child to use for quiet activities, active tasks, and wet and dry play. This can help children be calm or be inspired while playing. Make separate spaces with soft furnishings such as cushions and blankets using different lighting for children to explore. Dressing: Can your child put on their shoes and socks? Can they remove clothing to regulate temperature? Can they put on their jackets? Kinder bags: Is your child’s bag an appropriate size? Is it easy to operate? Does it provide enough room for all their belongings? Giving your child tasks at home: Cook with them, get them to help with setting up the table, etc. Lunch boxes: Can your child open their lunch boxes? If your lunch boxes are hard to open, your child will lose their confidence to keep trying. Lunchboxes with different compartments are best. These eliminate packaging and promote easy access by children. 2. What do you love about your classroom? 3. What was your favourite thing about today? This strategy also enables a smooth transition to home and supports children to be the focus of this routine time. Our language is important at these often tricky and pressured times. So take a minute to reflect on your child’s perspective during this transition. Your work has finished for the day; this is a moment for connecting with your child and having a bit of fun! Diana O’Ryan - educator at Newport Gardens Early Years Centre. Diana has been in the industry for 13 years and holds an Advanced Diploma in Children’s Services. Diana is a fantastic advocate for the ‘under threes’ in our industry. Diana is also highly committed to OH&S and supporting the everyday operations across the service. She’s a ‘Jackie of all trades’. An idea to use familiar objects as a way to explore numeracy. Using real life objects and props can give children the opportunity to transfer and adapt what they have learned from one context to another. This idea supports families to take note of letterboxes and the numbers on them in their day-to-day walks. While families are on walks, they take note of the letterboxes they see. Notice the numbers on your own letterbox. What is on the letterbox next door? What numbers do you recognise? Have we seen that number before? Walking in and around your local area is a valuable way for children to connect with their local community. Also, letterboxes are everywhere and this idea can be used on any walk where there are letterboxes. A tool to understand that the interactions we have with children support the learning of language. This tool supports educators by helping them to identify stages of language development, conversation styles and strategies such as (OWL) to support the educator to follow the children’s lead- to Observe, Wait and Listen. Through this technique, children at all stages can become actively involved, whether it's pointing, asking questions or making a comment. Parents can support their child's learning by taking advantage of everyday opportunities to enhance their child's language skills. Identify what motivates your child to interact with languages, such as reading a story they like, learning a song, or creating a picture. Everyday routines that do with your child are an opportunity to show them what an important part language plays in your world and theirs. For example, during bath time, you can pull up a comfortable chair so you can sit and chat. This can be the beginning of a lifelong habit of singing in the bath! You can also add kitchen equipment such as measuring cups for children to experiment with fluids and volume during bath time. Lifelong learning, reading is the key! Families often ask me what they can do at home to help their children with reading, writing, and maths. Luckily, the answer is simple: read story books! Reading has endless benefits for children of all ages, providing early literacy and numeracy skills essential for lifelong learning. Don’t just turn the pages, play with the words, and bring life to the story through conversational reading. Reading one favourite story and one new story each time you read with your child. Go back and forth with your child, chat and ask questions, pause for thought, and make it fun! Ask questions such as, ‘What can you see?’ ‘What can you show me?’ and ‘What can you say about the story, characters or pictures?’ Don’t just stop at books either. Recipes, the newspaper, signs and magazines are great too. Make your home a print-rich environment, filled with letters and words – creating a love for learning.